My family loves burgers and even though we live in California where the sun shines a lot, sometimes it's either too hot to go outside or it's winter time and grilling isn't an option. So when I was able to try the Good Cook Cast Iron Grill Pan I was thrilled to know I can grill year round! I had always wanted to try to make a stuffed burger so when I was sent my Stuffed Burger Press I knew I wanted to make something the entire family would love. After asking the family what they wanted one ingredient kept coming up, bacon! 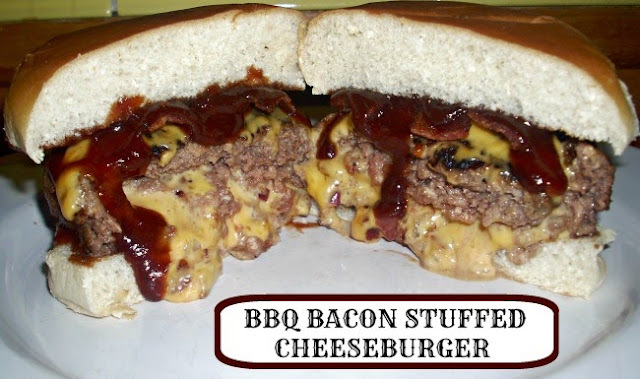 I knew right then one stuffed burger we would all love, a beautiful BBQ Bacon Stuffed Cheeseburger! I wanted to come up with a stuffed burger recipe that anyone can make at home. So the directions are below and if you like what you see you can vote for my burger in the Good Cook Stuffed Burger Contest, you can also enter to win a Stuffing Burger Kit! The contest begins Sept. 3rd and ends Sept. 17th. You can vote up to 3 times within a 24hr period. Each vote qualifies to enter into the drawing to win 1 of 10 Good Cook Burger Stuffing Kit. Preheat the Good Cook grill to medium to medium high on stove. Then grill bacon slices for the stuffing and top of burgers. Chop red onions, grate cheese, and crumble or chop bacon slices for the stuffing. Mix the hamburger meat with the Worcestershire sauce, seasoned bread crumbs, garlic salt, black pepper, salt and white pepper (optional). Once fully mixed pat into small thick patties and place inside Stuffed Burger Press. Push down to make a patty, then flip the press handle over to stuffed side and make a indention into the patty. Once you have pressed the pocket for the stuffing to your liking, add the stuffing ingredients. Then pat out another small hamburger patty, set on top of the stuffing and use the press side to push the hamburger meat together. Now you can cook on your Cast Iron Grill and grill each side until meat is cooked to your preference. Before the patty cools add a slice of cheese to melt on top. Coat each side of hamburger bun with barbecue sauce, place your stuffed hamburger patty on bottom bun and top the patty with slices of bacon. Add your top bun and enjoy! Don't forget to go vote for this BBQ Bacon Stuffed Cheeseburger at the Good Cook Stuffed Burger Contest! Get a Capri Sun Big Pouch and Start Picking! EAGLES Will Help You Quit Smoking Today!! My Yummy Bacon & Egg Panwich! !